Looking for St Patrick's Day craft ideas? 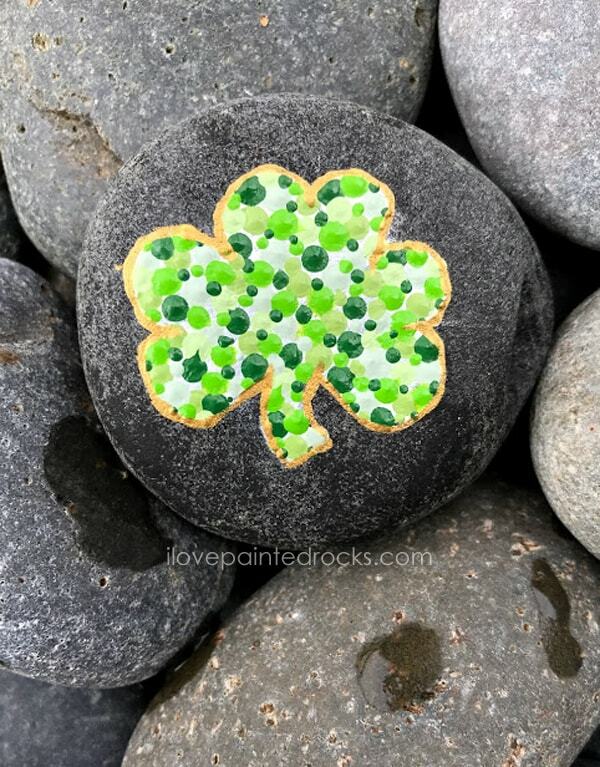 This pretty dot painted shamrock silhouette painted rock is the St Patrick's Day rock painting idea you're looking for! 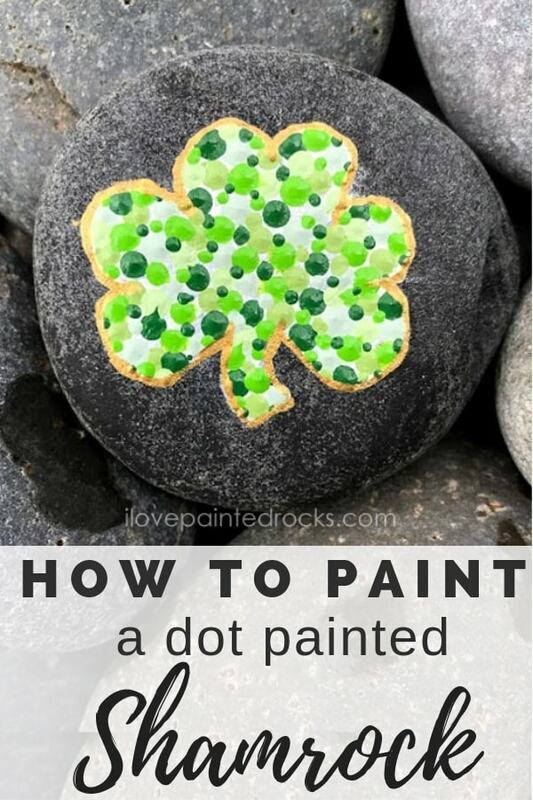 This dot painted shamrock silhouette painted rock looks like it is an advanced level technique but it is, in fact, very easy to make. Using a piece of chalk to draw the shamrock outline first makes this St Patrick's Day craft a little easier. I used five different shades of paint to create the dots. If you don't own five different shades of green paint, just mix a little of the green paint you do have with varying amounts of white to make your own shades of green. If you are inspired by this rock painting idea and decide to make your own, won't you share? I'd love to have you share your painted rock creations on the I Love Painted Rocks Facebook Page. If you are willing to let me feature your rock on this website, you can submit your unique painted rock creations here. Not sure which paint to use on rocks? *The FolkArt Multisurface paint used in the post and video is a self-sealing paint so will not need a separate sealer. If you want extra protection or are using a non-self-sealing paint, learn more about how to seal painted rocks here. Sometimes it is easier to watch a video for how to do some rock painting techniques than it is to simply read about them! 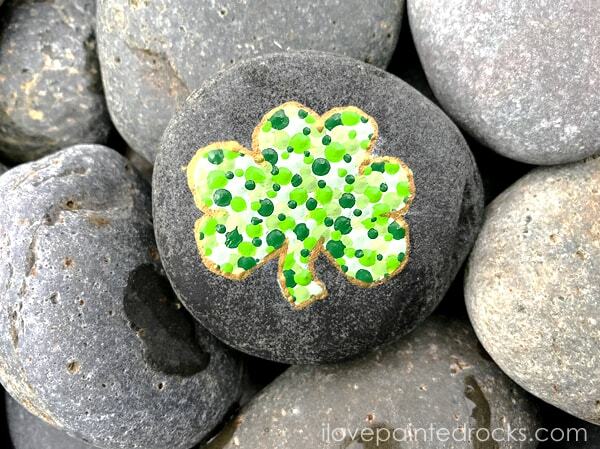 This video will show you exactly how to made my dot painted shamrock painted rock craft from start to finish! If the video is not auto-playing on this page already, view it on the I Love Painted Rocks YouTube channel instead. To draw a shamrock, first use your chalk to draw a cross shape on the flat, smooth side of your rock. 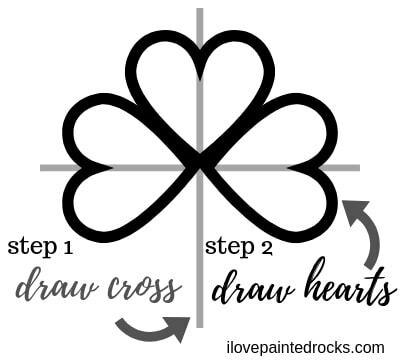 Next, draw a heart shape over the cross so that the center of the heart aligns with the lines of the cross as shown in the illustration above. Repeat to draw three hearts for three leaf clover and then draw a stem coming from the bottom where there is not a leaf. If you would like to have a four leaf clover, draw the fourth heart along with axis and draw the stem coming out from between two of the leaves. Use a paintbrush dipped in water to wipe away the guide lines so only the silhouette lines are left. Use white outdoor safe paint like FolkArt Multisurface and a small brush to paint over the chalk guidelines. Fill in the shamrock outline you just made so you are left with a white silhouette. Once the paint is dry, wipe the stone with a damp towel or brush with just water to wipe away any remaingin chalk residue. Prepare a palette with five different shades of green outdoor safe paint like FolkArt Multisurface. If you don't own five different shades of green paint, made varying shades of green by mixing different amounts of green and white paint together. Remember: the more white, the lighter the end color will be! Once you have 5 different shades of green paint ready to go, use the wood end (NOT the brush end) of your paintbrush to dip into the paint and then onto the rock to make a dot. For best results, dip the end of the brush every time you want a dot. I like to make all of one shade's dots first, then go on to the next shade so I don't need to clean the end of my brush as often. Once all the largest dots are in place, allowe to dry or hit it with a blow dryer. Add smaller dots by using the tip of a fine tip paintbrush to repeat what you did for the largest dots, this time using the brush bristles to make smaller dots to help cover more of the white background paint. Finally, use an outdoor safe metallic gold paint and a fine tip paintbrush to paint an outline all around the outside of the shamrock. The FolkArt Multisurface paint I used to make the sample rock for this project is self-sealing. This means that once completely dry and cured, it will be waterproof and weatherproof. Not all paints are self-sealing and outdoor safe, so check the particular paint you used if you used anything other than FolkArt Multisurface. When in doubt, it's best to seal your rock. For more information on best practices for sealing rocks and how to choose the best sealer for your rock painting project read: How to Seal Painted Rocks. 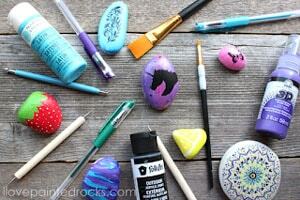 If you love this painted rocks project, don't forget to share it! 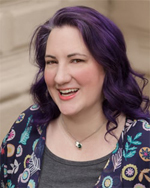 Carissa Bonham is a lifelong crafter and award-winning online content creator. She creates craft tutorials for both I Love Painted Rocks and Creative Green Living. Portland, Oregon locals can watch her as a monthly guest expert on KATU Afternoon Live. You can also watch her paint rocks on the I Love Painted Rocks YouTube channel.